URB-E won Notable in the Transportation category, alongside a beautiful cabin design by Hawaiian Airlines and the innovative Brum Brum bikes. The Core77 jury particularly appreciated the quality, engineering, and care that went into URB-E’s design and production. On the Core77 website, you can also read more about the URB-E story. URB-E represents the synergy of two talented, committed minds, one with incredible design sense and one with finely-honed engineering prowess. Together, they created a feat of functional design, a beautiful product meant to solve the real, pressing problem of last-mile commuting. 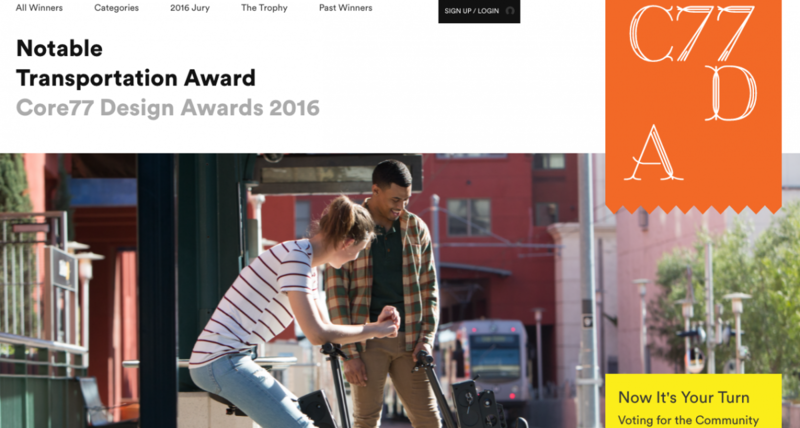 The Core77 Design Award recognizes URB-E’s innovative contribution to the world of urban design. Help URB-E Win the Core77 Community Choice Award! All Core77 Design Awards Nominees are also eligible for the Core77 Community Choice Award. For the Community Choice Award, the public votes for their favorite honored project on the Core77 website. It’s an exciting opportunity for the public (you!) to get involved in the decision-making process. The way we see it, it's an even better opportunity for URB-E fans to come out in full force. It takes a village to make a good idea into a great product, and we’re so grateful for the support of our community. If you love URB-E, visit the Core77 Design Awards website and give us a vote! Questions about the Core77 Design Awards or about URB-E? Call us at or email support@urban626.com.